Oct. 16, 2014 12:00 a.m. Candidates for mayor in both Langleys faced off Tuesday night in the first debate before the November 15 election. Hosted by the Greater Langley Chamber of Commerce at the Langley Golf Centre in Murrayville, the debate saw all six candidates, three from the Township and three from the City, answer questions on transit, drugs and crime, development, and taxes. 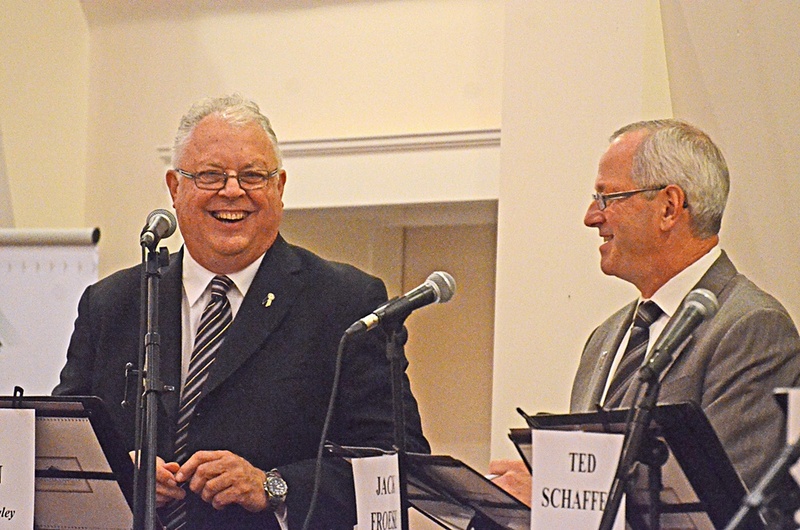 Some of the most pointed comments of the night came from incumbent Township Mayor Jack Froese and Rick Green, the former mayor Froese defeated in the 2011 election. â€œIn 2011, I entered a mayors office that was fraught with turmoil,â€ Froese said in his opening remarks. He said he had to rebuild relationships and bring back stable government. He also needled Green towards the end of the debate, after a question about whether the Township should sell public land to keep taxes down. After Green said he would not do that, Froese brought up the property endowment fund Green had proposed early during his term in the mayorâ€™s chair. He said the idea of selling land sounded like Greenâ€™s idea. â€œI guess we donâ€™t let the truth get in the way of a good story,â€ Green shot back, defending the plan as being about protecting and developing assets for the taxpayer. â€œItâ€™s not about selling land,â€ he said. Serena Oh, the third Township candidate, often wandered off topic when answering questions, talking about global warming, job training, or deforestation. On a question about Brookswood development, she talked about bringing sewage systems and street lights to the Kwantlen First Nation reserve in Fort Langley. The first question to the City candidates was about whether development is on hold, citing the long delay on the proposed Charleston Place project for the former nightclub site on 203rd Street. â€œNo, the City is not on hold,â€ said incumbent Mayor Ted Schaffer. He said that in fact a new proposal for the site, for a five-storey condo complex, was coming forward next week. â€œWe are land-poor,â€ Caine said, and noted that while there must be re-development, he said he has reservations about the City â€œgoing vertical,â€ and that more attention needs to be paid to infrastructure. Ray Lewis, the third candidate to enter the race for City mayor, was most vigorous on questions about crime and related issues. He cited homelessness and drug addiction as the deep issues that need to be solved, before people will want to invest in the community, he said. Development in Brookswood and Willoughby was the subject of several questions for the Township candidates. Green called the Townshipâ€™s community planning process flawed. â€œItâ€™s important for the community to buy into both the process and the numbers, and what they want the community to be,â€ he said following a question on the failed Brookswood Official Community Plan. Froese said there had been many workshops on the OCP, extra open houses, and that many people spoke on the issue before council defeated the plan. He wasnâ€™t sure when the process will start again. A related question on a lack of school spaces in Willoughby also drew some sharp responses. â€œThe development in Willoughby in my opinion is out of control,â€ said Green. â€œIâ€™m not suggesting a moratorium,â€ he said. But he said the Township needs to exert more control over the development process. Froese said rapid urbanization is a challenge, but that Metro Vancouver is going to absorb about one million people, 100,000 of them coming to the Township over the next 20 years. â€œWe are learning and building better and better communities,â€ said Froese. He also pointed to the number of new school spaces opened in recent years, as two elementary schools and a middle school have opened in Willoughby. He opposes regulating housing, he said. â€œThe market will dictate if thereâ€™s enough houses,â€ Froese said. Getting the Township involved in regulation would only drive up the price of housing, Froese said. Oh said that there is a need for more secondary suites in the area, including some for people with larger families. Secondary suites are already legal in the Township for single-family houses. Several candidates were highly critical of TransLink and the amount of bus service the Langleys receive. Schaffer said the TransLink Mayorsâ€™ Council was working hard to get more transportation south of the river, but it was a lot of work with a minority of communities here. Lewis also recognized it was an uphill battle and that people here feel theyâ€™re being shortchanged, but said Langley City must cooperate. â€œIâ€™d like to see us opt out of it,â€ he said. â€œCertainly weâ€™re not getting our fair share,â€ Green said. He said he wouldnâ€™t support any proposal that would levy new taxes and fees until Langley got improved transit service. Langley is getting some value from TransLink, Froese said, citing the Golden Ears Bridge and Carvolth bus exchange. He noted that light rail from Surrey to Langley is in the 10-year proposed transit plan. The next debates will be an all-candidates meeting for City mayoral and council candidates on Thursday, Oct. 16 at the Cascades Casino at 7 p.m. A Township candidates forum hosted by firefighters will be held Friday, Oct. 17 at the Willoughby Hall at 7 p.m.